On the last day of Bout of Books 18, I finally finished Love Walks In by Samantha Chase. And I read 30 pages of Does This School Have Capital Punishment? by Nat Hentoff before calling it a night. The total number of books I finished during the read-a-thon was 13. This is around half of what I usually read during Bout of Books, but being sick and having sick children cut down on my reading time and and on my ability to stay up late reading. I'm hoping for better reading conditions for Bout of Books 19 this May. OMG, you read 13 books last week??? That alone is an impressive accomplishment in my book!! And you did all that despite being sick and taking care of sick children, you're awesome!! I had fun during BOB 18 and met my reading goals. 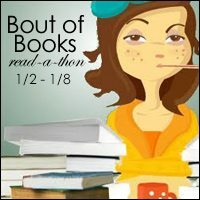 I also had fun participating in a few of the readathon challenges and posting comments on other people's blogs throughout the week.